Our cutlery workshop was created and is still located in the town of Thiers since 1920. This city is the capital of the French cutlery, two-thirds of knives produced in France for the pocket, kitchen or table are manufactured by Thiers companies and its region. Expertise cutlers Thiernois draws its inspiration from a tradition that dates back more than six centuries. Le Thiers knife is a model filed with the INPI (National Institute of Industrial Property) by the Brotherhood of “Le thiers” knife in July 1994. This brings knife enthusiasts, professionals or amateurs, and work for maintaining a high level of quality in the manufacture of knives as evidenced by the “Jurande” signed by all professional members. To proceed with the manufacture and marketing of Le Thiers knife, Cutler is obliged to appear on the knife brand “Le Thiers” and the stamp “T.” . In any case, Cutler will not perform operations relating to any rank outside Cutler Basin Thiers. Cutler will be required to produce the knife “Le Thiers”, and all its components from quality recognized by the whole brotherhood materials. This famous knife Le Thiers has just celebrated its 20th anniversary this year, today, fifty cutlers make this knife. You can find more details on the website of the Brotherhood of Le Thiers knife. In Fontenille-Pataud workshop, we also produce our Le Thiers knife for several years now. We chose to create a knife that combines tradition and technical innovation: lightweight knife, easy opening and closing with one hand, liner-lock system with hardened steel ball to keep the blade closed, Teflon mounting ring. Find our entire production of our Le Thiers folding knives. In Fontenille-Pataud, we produce many knives with a blade in Damascus as you may have noticed on our website. Damascus steels are for the knife maker what gold is for the jeweler. Very important : We mainly offer stainless steel Damascus Swedish (www.damasteel.se ) we know and have experienced. We offer various types of Damascus steel blades to accompany your knife, these different kinds of Damascus have all the same technical qualities, the real difference was mainly in the aesthetics of the blade. You choose your blade Damascus according to your tastes. The Damascus steel is obtained by alternately welding mild steel and hard steel layers on top of each other steel. The number of layers varies from a few tens to a few hundred depending on the desired effects. We also manufacture some models full damascus, such as the knife “Le Thiers” which has a plate in Damascus, and also the knife Laguiole Nature Full Damascus exceptional model that has a handle in Damascus. You can also find more information about our different types of steel used to manufacture the blades of our knives on our website. In our cutlery, we manufacture french folding knives, but we also specialize in the manufacture of tabeware : Laguiole knives,Laguiole forks, Laguiole spoon …. to see our range of tableware. Our table knives are usually sold in boxes of 6 or 2 knives, wooden boxes that come with our items are in oak. All these tableware are handmade in our workshop in France. We created a model “Le Thiers” in table knives, find our collection of table knives “Le Thiers” on our website. 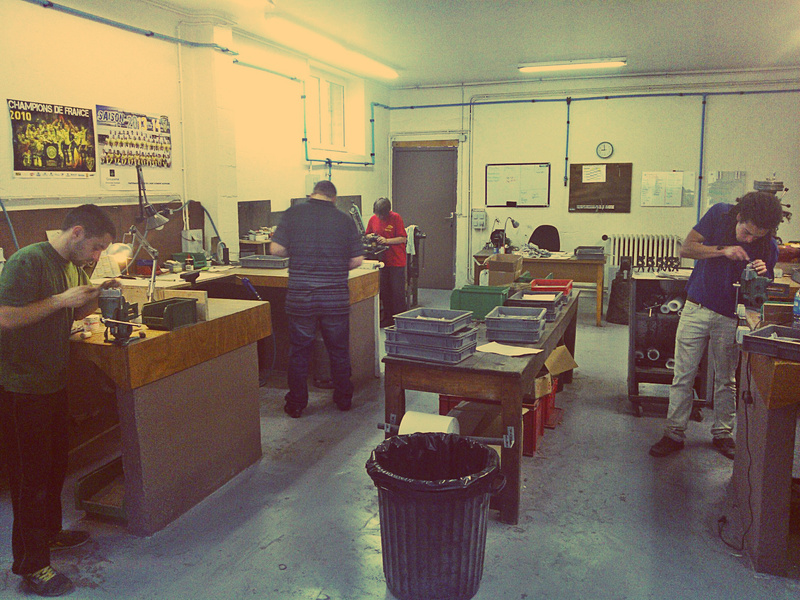 To share with you the life of our workshop and our craftsmanship, here is a photo taken of our cutlery live this morning. The “Guillochage” of our knives is usually done in the morning by our cutlers, this manual and craftsmanship requires a relatively long implementation. Unlike many of our colleagues cutlers, we don’t obtrude any predefined “guillochage” pattern, each cutler doing this work freehand with the inspiration of the moment in order not to hinder the talent and to design singles knives. 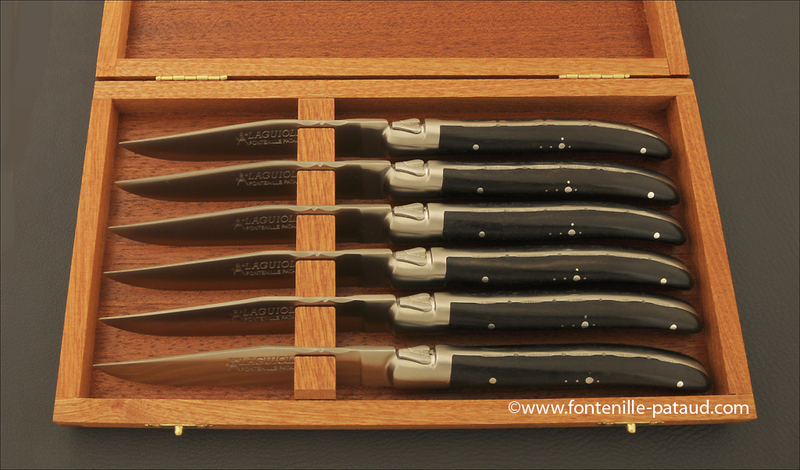 We made a point of honor among Fontenille-Pataud in recent years to improve every day our “guillochage” technical to offer knives ever worked, the talent of our cutlery did the rest. This work requires a learning curve long enough to master every wish files to get the desired rendering. “Guillochage” of our knives is a step to chiseled the back of the knife before mounting: springs, plates and blades. Our cutlery use small files of different shapes and sizes to produce the desired pattern. Whatever the range of knives, all models possess a default spring manually with “guillochage”. We also offer a so-called “Guilloche” range, or in addition to spring, the plates and the back of the knife are make with “guillochage”. Find an example of the range of “guilloché” knives our model Laguiole Nature. Find our various knives video to get a clearer picture of the quality and technology we handmade for folding knives in our workshop. All our knives are made one by one by our cutlery and respect the expertise and cutlery tradition of our region. To make this easier and more comfortable to use object we add a lock back system on some of our knives which allows you a soft opening and a real safety. Examples of videos, find all the videos of our knives on our site.